It is not very often that I do not finish a book. There are some books that I find very intense and I put them down (sometimes for a year or more!) until I can handle them again. But if I find them that intense to read, I think that is a mark of a good author. I did this with Practical Magic, which was on hold for nearly two years. I still have The Shining City by Kate Forsyth on hold (it's been more years than I care to count, but the first book was scary and intense, though amazing. The second book gave me anxiety only about 30 pages in!) I absolutely will finish it however. I am even now starting to get to a point where I am ready to manage it. She is such a great author and I love her books, but I need to take them slowly! There have been a few books that I did not like. After hearing wonderful things about him, I decided to try Piers Anthony's books. I (somehow) managed to make it through his first Xanth book, A Spell for Chameleon. I thought the book itself was HORRIBLE, but that his overall ideas were so promising and cool! 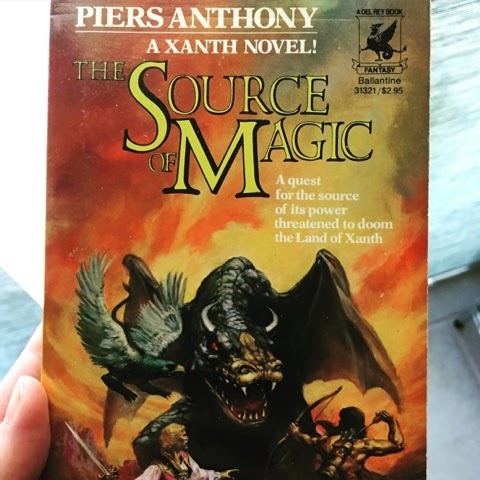 So I thought, the second book, The Source of Magic, would surely be better! Nope. And do you want to know where I stopped? Close to the end, in the middle of a climactic battle scene. I was so freaking annoyed with his writing that I could not read more, no matter how much promise his universe and general ideas held. I was so angry. His books could have been SO good, funny, clever, amazing, but he seriously knows how to beat a dead horse with a stick and I could bear it no longer! I'm sure his fans (of which he surely has many, have you seen how many books he has written???) will find this blasphemous. My dislike was so strong that I doubt I will go back to read any other books that he has written.